Just in time for the holidays, never too early to plan ahead. Here’s an idea for a wonderful dessert on your next family or friends gathering. The pound cake is a dessert tradition for many families the world over, and for good reason. Traditionally made of one pound of each of the following ingredients: flour, butter, eggs and sugar, it is simply heaven to bake and to serve. 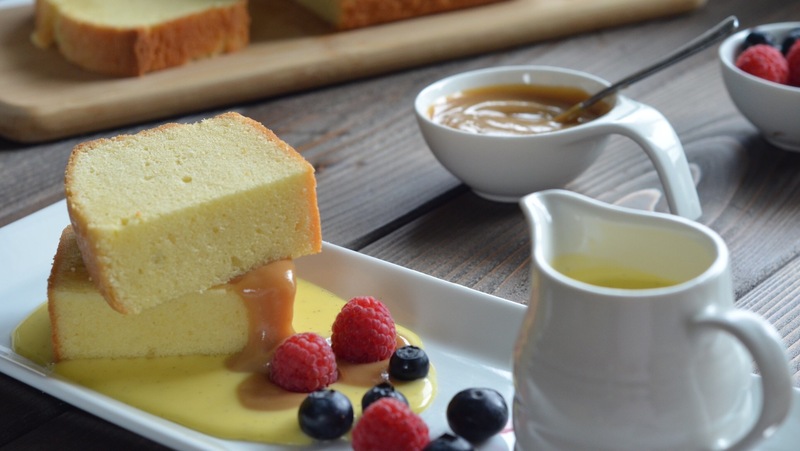 You can make your pound cake even more interesting for your guests by serving it with dessert sauces such as creme anglaise, Dulce de Leche or even a scoop of your favourite ice cream! Berries are a tasty and healthy addition, as well. This way, everyone gets to “dress” their own dessert to their own liking. In case you’d like the recipe for pound cake, I’ve adapted it from Ana Olson (love her). The original recipe is lemon pound cake, I just omitted the lemon, so it basically is Butter Pound cake. If you’d like the original recipe, you can find it here. Best to use vanilla bean, but you can also use pure vanilla extract. _Preheat the oven to 325 F and grease a 9-x-5-inch loaf pan. 1. Beat the butter and sugar using either: electric beaters or use the paddle attachment of your stand mixer. Beat at medium speed until light and fluffy for about 3 minutes. 2. Gradually add the slightly whisked the eggs to the batter, scraping down the sides and bottom of the bowl with every addition. Add the sour cream and vanilla together and beat this into the batter. 3. Add the all-purpose flour and cake & pastry flour and salt to the batter, mix until fully incorporated, scraping to the bottom of the bowl to ensure even mixing. 4. Transfer the batter into your greased loaf pan, give it a few taps on your kitchen counter to release air bubbles. 5. Bake the cake for 65 to 70 minutes or until a tester inserted in the centre of the cake comes out clean. 6. Let cool on a wire rack. If using a vanilla bean, split the bean and scrape the inside to get the pulp and add this to your milk + cream. If using vanilla extract, add it in step 4. In a small pot, scald the cream, milk and half of the sugar over medium heat. In bowl, whisk egg yolks with remaining sugar; temper the eggs by whisking in the scalding milk and cream mixture in thin steady stream. Place the egg and cream+milk mixture back in the small pot. Cook, stirring constantly, until it thickens enough to cover the back of the spoon or until it reaches 82C / 180F. Once done, pass through a sieve to remove any egg yolks that might have curdled in the process. If setting aside, make sure to place a plastic wrap directly on the surface.